Hey readers! I’ve been slowly working on transferring my blog from Blogger to WordPress and I’ve been facing some struggles along the way, but I’m slowly getting there. Thanks to friends who’ve been sharing tips and tricks with me. But today I want to show off some projects I’ve been doing for the Blank Slate Sewing Team. The team is a collective of bloggers making and sharing Blank Slate Patterns‘ designs. Blank Slate is made by Melissa of MellySews.com, a friend and fellow Austin-ite, who designs easy to sew womens and kids patterns. So far I’ve sewn the Oceanside Shorts and the Juniper Jersey (click to see my original posts at Mellysews.com with more pics!). 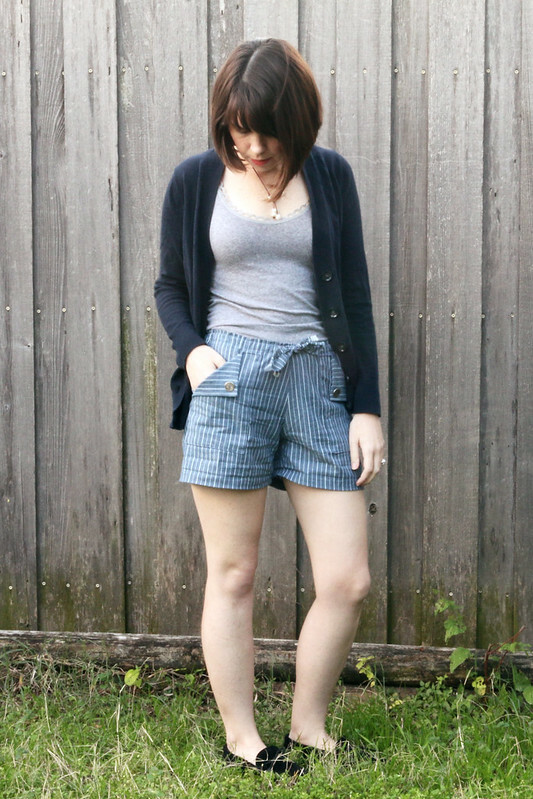 The Pattern: My most recent make are my Oceanside Shorts. This pattern has the option to make pants or shorts. They were quick to sew – no side seams, no zipper, patch pockets. I serged all my seam allowances and tied knots at the ends of my drawstrings. The Fabric: The pattern calls for drapey bottom weight material but I took a risk and used a striped cotton shirting which I got for free from a fabric swap. It works pretty well with this design although the thinner fabric does get pretty wrinkly. But the fabric looks like linen and these are a casual style or shorts so I think it works okay. I used two metal shank buttons from my stash. The Changes: My only real change was rolling up the legs about two inches to make cuffs. The pic above is the length of the shorts without rolling. I didn’t have to do any fitting to these pants which surprised me. They’re pretty well fitted right out of the box. Obviously every body is different but I think the style is loose and casual enough to be forgiving. 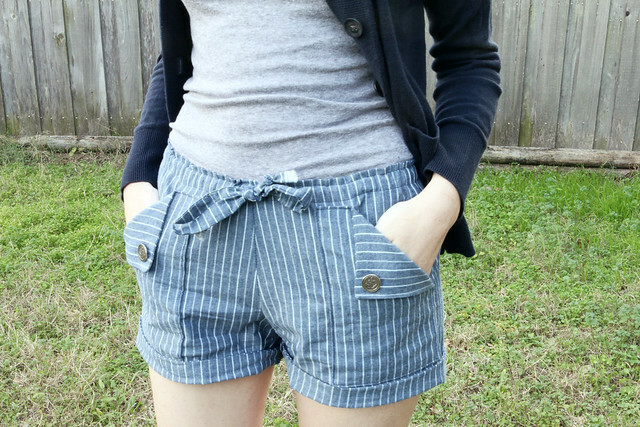 The Results: I’m diggin’ these shorts, like, I highly recommend this pattern. I like that the drawstring isn’t just one long length of fabric. It’s two fabric tubes attached to a piece of elastic hidden in the middle. You only see the fabric drawstrings in the front but the elastic makes the waistband more snug in the back. I just wish I had used a better quality elastic. I can tell that it doesn’t have good recovery and it stretches out too much. If only it was warmer so I could wear my shorts outside! These are going to be in heavy rotation this summer. The Pattern: My first project was the Juniper Jersey. I liked that I could squeeze out the pieces with scraps and I could mix and match fabrics. I cut a size small which fit well. The Fabric: My scrap yellow fabric is a double-knit? It might be a ponte… at this point I don’t remember. The white lacy top fabric is some sort of franken-fiber stretchy stuff I bought on a fabric shopping trip to Dallas. 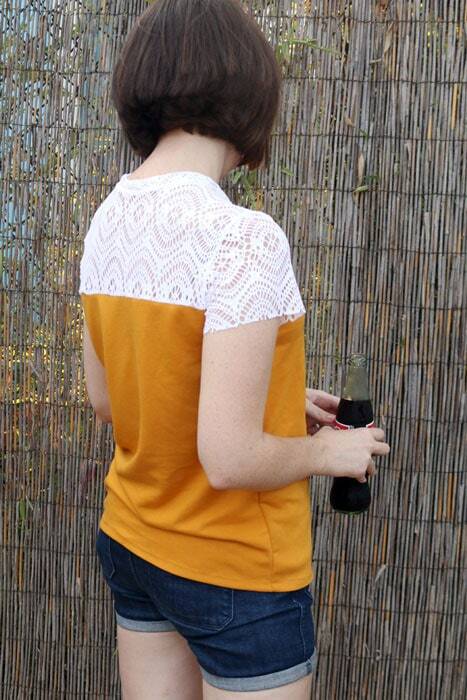 I loved the lace effect but I was concerned it wouldn’t hold the weight of the yellow knit. Turns out the lace has a good recovery and it works just fine. I serged all the seams which was good considering the negative space in the lace would have made it difficult to sew just on a regular machine. The Changes: In the end I left the sleeve hems raw. At first I tried turning the raw edge under twice and hemming but it the lace created a lumpy mess so I just chopped it off rather than try to unpick my stitches. The fabric doesn’t fray which is convenient. 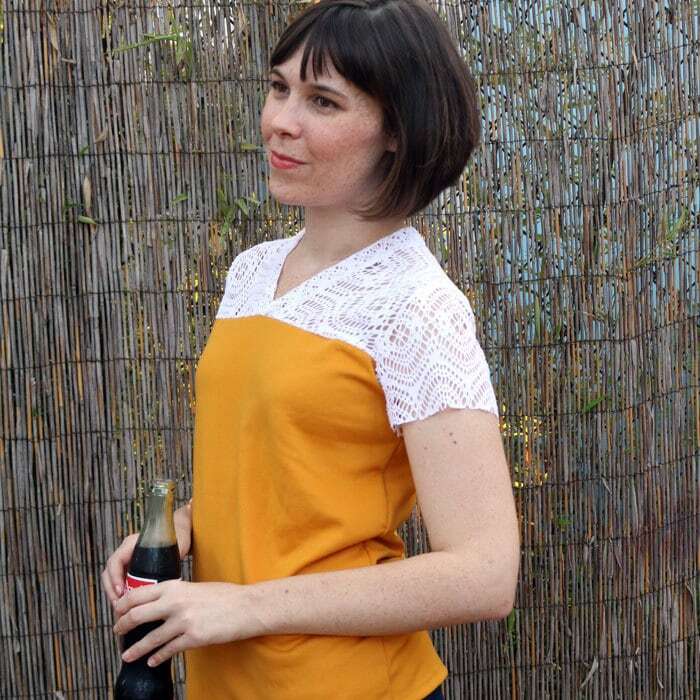 The Results: I’ve worn this shirt a bunch of times since making it. 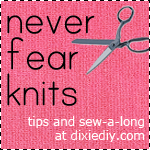 If you’ve never sewn a V-neck before then this is a good way to start. With the shoulder yoke it’s like a “cheater” v-neck, super easy to make.